Yesterday was outside. After dropping Jeremy off in Preston, I decided to try a different way back home. I was also trying to find some large-ish stores on the way. After my success fixing Mom’s Town and Country last month, I wanted to fix Ashley’s Nissan SUV that had the same problem. The other issue was some blinds in the window next to Jeremy’s computer. He told me that they wouldn’t release and when the sun was out, as it was Monday morning, the computer screen was very hard to see. I took measurements but didn’t write them down. Going through Issaquah, I spotted a Home Depot so I went in and looked at blinds. As soon as I was confronted with the enormous selection there, I forgot the dimensions that I had measured. What a yutz! Next I stopped at a car parts store in Redmond. They tried to tell me the struts for that car were different on each side and $70 apiece. Umm, I had looked at them the night before and I was pretty sure they were essentially the same as the T&C. Pass. OK, just go home. I measured the blinds again and this time wrote the numbers down. Duvall had a car parts store so I went there. They had the pair – each side the same – for around $60. They wouldn’t be in until the next day but that was ok since I didn’t have Ashley’s car anyway. The nearest Home Depot or other large hardware store was at least a half hour away so I decided to wait and went back home for lunch. After lunch, I took down the blinds to see if I could figure out what was wrong with them. After a little bit of fiddling while watching the mechanism, I discovered that these blinds are very sensitive to their horizontal positioning. Once set flat, they go up and down as pretty as you please. That evening, I found out that the blinds in Ashley and Jeremy’s bedroom had the same problem and the same fix. No more worries about the neighbors bright light shining into their bedroom at night! On the way back to pick up Jeremy in the evening, I left a little early and went to a music store – not Guitar Center! – in downtown Issaquah. It was nothing special, but the downtown was nice: newer but not mass-produced shops along a Main street. Too bad it was jammed with cars at this hour (6 pm). Today was more inside, although Rosalie and I started outside after dropping Ashley off at work. 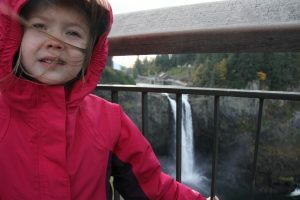 We went down to Snoqualmie Falls. The big news there was not the amount of water going over the falls, but the wind blowing over the ridge. 40 or 50 mph gusts were pushing us down the path. We were well bundled up so not cold but not comfortable either. The temperature was in the high 40s. We came home via the car parts store and enjoyed the mild, non windy air at home. I put the new struts on Ahley’s car and Rosalie and I played around the house. We even raked some leaves! For all that, it seemed like an inside day as we spent the afternoon in the house. Puzzles, dolls and drawing were the bulk of the activities. After Mommy and Daddy came home we all went out for pizza and a skillet cookie in Carnation.